[Full tutorial] How to transfer notes from iPhone to computer? How to back up iPhone notes? Home » How to back up iPhone notes? This article explains how to export notes from an iPhone using CopyTrans Contacts. The method works with any iPhone, iPad and iPod touch as well as with all recent Windows editions including Windows 10. The method also helps to transfer notes from Gmail, iCloud, Yahoo, etc. Install the program. If you need help installing, here’s the installation guide for you. Run the program and connect your iPhone to the computer. From the main CopyTrans Contacts window click the Note icon on the left-hand side panel. NOTE: to transfer notes from iCloud, Gmail, or Yahoo, connect the respective online account in CopyTrans Contacts. Select the notes you wish to sync from the notes list. 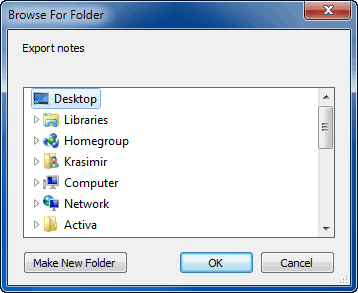 To select several notes, hold down the CTRL key or use the check boxes. You can select all iPhone notes at once by pressing CTRL + A or by checking the box next to “Notes”. Click on the “Export selected” button. Choose how to export the notes from iPhone. In this case we clicked “To a file (all note formats)”. 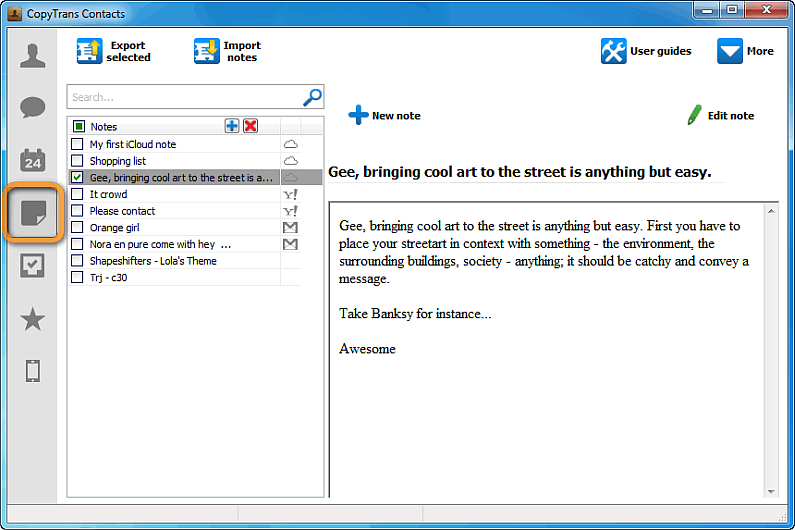 As you see you can export your notes from iPhone to Outlook. Navigate to the location on your PC where you wish to transfer your iPhone notes and click OK. Your iPhone notes will be backed up to your PC in the form of individual files. This is an easy way to back up iPhone notes.